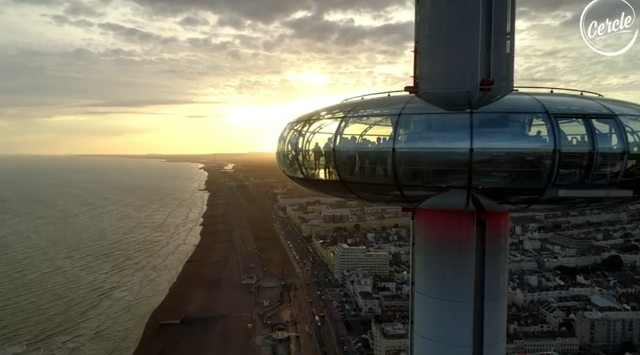 Watch Fatboy Slim playing at 450 feet high on the British Airways i360 in Brighton for Cercle. (tracklist) - Track? !D. Watch Legend Fatboy Slim playing at 450 feet high on the British Airways i360 in Brighton for Cercle and check out the tracklist below. British Airways i360 is a 162-metre (531 ft) observation tower on the seafront of Brighton, East Sussex, England at the landward end of the former West Pier. The tower opened on 4 August 2016.From the fully enclosed viewing pod, visitors experience 360-degree views across Brighton, the South Downs, the English Channel and on the clearest days it is possible to see Beachy Head 17 miles (27 km) to the east and the Isle of Wight 49 miles (79 km) to the west. British Airways i360 was designed, engineered, manufactured and promoted by the team responsible for the London Eye. It is estimated by the developers that the i360 will generate more than 440 permanent jobs; 160 posts at the attraction, and additional jobs from the spin-off benefits to other businesses in the city. The attraction cost £46 million, with £36 million being funded by a Public Works Loan Board (PWLB) loan through Brighton and Hove city council. Formerly known as the "Brighton i360", the project aims to attract 739,000 paying customers every year.